For the inaugural post to this blog, let’s be inspired by a little-known but ultra-important creature: the diatom (dye-ah-tom). 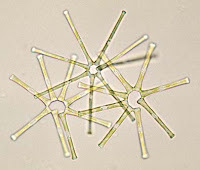 My appreciation for diatoms began during a foray into marine science during college. The career didn’t stick, but my appreciation for bizarre and beautiful sea creatures did. On top of being lovely and weird, these little water-dwellers play vital roles in our world. Humans harvest diatom-rich sediments and process them into diatomaceous earth for uses ranging from wine filtration to garden pest prevention. "These miniscule creatures, long regarded primarily as the bottom link of the marine food chain, capture nearly as much of the gas as all the trees, grasses and other land plants combined, majestic redwoods included." So here’s to the earth and its brilliant systems: the ingredients for balance and change are already built in. They are microscopic, intricate, and stunning.